Chronicling Jack Kirby's Fourth World after the 1970-1974 run. While his interior work is still only on Detective Comics at this point in his career, Marshall Rogers delivers one of his best pieces of art for the cover of this issue, complete with the title: "Double-Bind!" Seriously, click on the picture above and bask in its glory. The interiors of this issue are once again by writer Steve Gerber and penciler Michael Golden, joined this time around by the legendary Russ Heath on inks. A cosmic setting seems a weird choice for Heath, a man known best for his work on westerns and war comics, but his inks only seem to strengthen the young Golden's art. The book opens with Oberon screaming bloody murder as he's in the hands of two Apokoliptan soldiers, dressed in the kind of crazy armor Golden would make a staple of Micronauts. 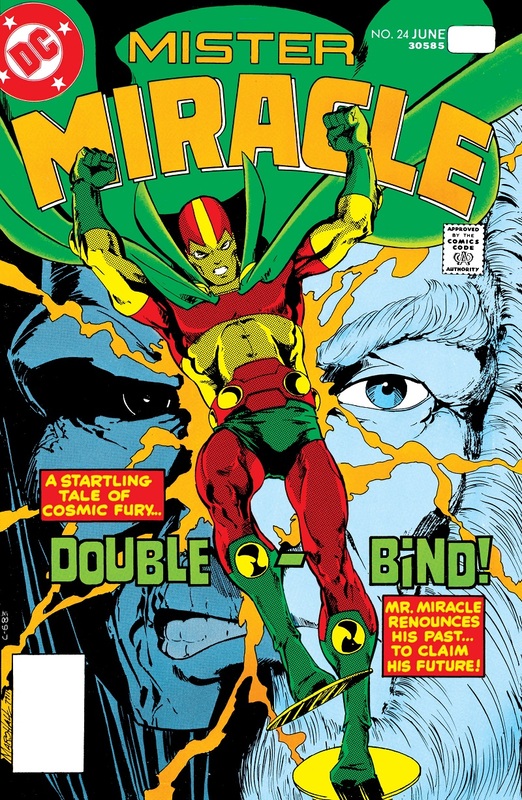 Yet in a flash of lightning behind them all, Mister Miracle has returned to reality from his detour on (with?) Ethos. He makes short work of Oberon's captors, but "Darkseid's Photon Patrol" shows up and starts blasting at the heroes with lasers. Instead of leaping into action, Scott Free bends down and examines the ants native to the land. He can hear their screeches of outrage, especially when he amplifies them to the point the sounds turns agonizing to the Photon Patrol. Oberon inquires how Scott was able to commit such a feat. Mister Miracle explains that he now possesses the abilities of Mother Box, after joining with her several issues back. This honestly is a godsend to any fan trying to figure out Scott's powers since he first gained them as this is the first time anyone tried to explain exactly what they are. I serve the cause of freedom, [Himon] as I see fit. Don't dismiss me as a pawn of Darkseid, simply because you never foresaw this eventuality. I've wounded your vanity, Himon, not your grand design! With those harsh words, he asks Barda to accompany him. Though nervous she takes his hand... and they teleport to their mansion home on Earth. It's night here and exhausted everyone is ready for rest. Oberon turns in and Barda asks if Scott plans to come to bed, but he responds, "I need a few minutes alone, to reflect." Barda doesn't want to do so though, as after their long separation she wishes to be close to her husband. She asks for his secret, but he refuses to share. Instead he goes on about his failed role as messiah to Apokolips and his conversation with Ethos. That a different path than one side of the war or the other is possible, all with Earth as the key ingredient. He goes on, "You don't understand, do you? But you will! In time you must!" 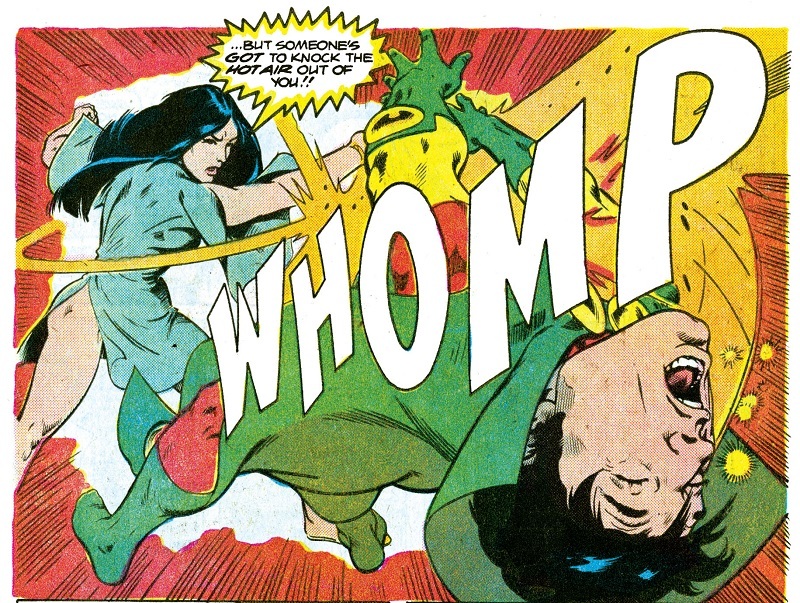 Barda stops her wrath with a simple "Forgive me, darling" before she decks him in the jaw. "Someone's got to knock the hot air out of you!" As she helps him up, she gives him two tidbits of wisdom herself: "One: even a visionary has to keep one eye on the present. And two: never neglect a lonely wife!" In pro wrestling, this would be followed by a "you deserve it" chant. The next morning, Scott is up and visiting multiple businesses as he sets up his new plan, the start of which seems to be a press release delivered by his old acquaintance Ted Brown. Elsewhere, a young woman walks deep into the Mojave Desert as her parents watch from a butte high above. The man is worried about her safety of this plan, but the mother simply snaps, "quiet, you simpering coward!" The young woman, Alianna, walks up to a rattlesnake. When the snake lashes out to strike, she catches it by the neck, twists it and slams its head against the rocks to kill it. The mother declares, "she's everything I might've been if I hadn't married you!" Ouch. Back at the home near Metropolis, Scott breaks bad news to the others: they're moving to California, where most American fads begin. But first they have to make a stop at Las Vegas. Their purpose there is simple: to pull off an elaborate trick that is a double-bind. (Roll credits.) He will have to face both impending suffocation and a harrowing fall. Fans have gathered outside the hotel as Scott is wrapped in chains. He's put into a tank which is welded shut. Barda lifts it into the air and they attach it to a helicopter. The chopper flies away, out and over the Hoover Dam. 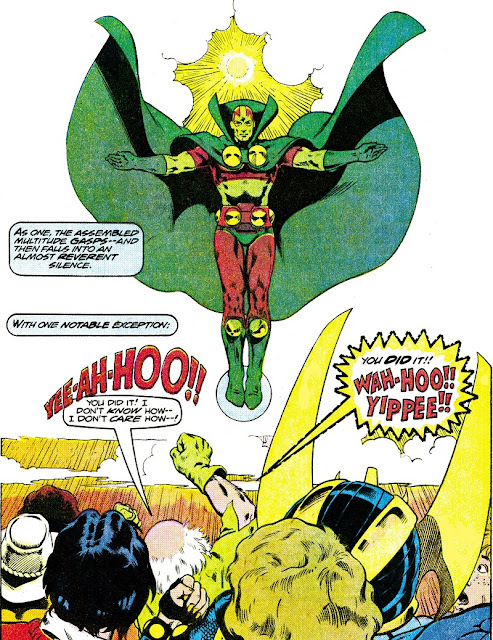 Ted Brown, Oberon and Barda drive after the helicopter and the dangling escape artist, showing they won't help Mister Miracle escape. Until he rises up from the water atop a disc, arms outstretched, the light of the sun glowing behind him. The fans in attendance all look on in shock and awe, except Oberon, who whoops with joy. Not even Adam Warlock threw out the Jesus metaphors this hard. For all the talk Gerber gave last month that Mister Miracle couldn't be the Apokolips messiah seems to now have turned him into an earthly one. He went so far as to not show Scott succeed at an escape, so he could rise alive from the water. While Kirby always made it clear Scott was an important part of the struggle of the New Gods, it never felt like he wanted to get as heavy handed as the writers of this run want to get. It's certainly a different take on the character than Kirby's own, though I feel like neither writer has taken the time to examine it as they threw scripts together quickly. The next issue box proves especially verbose as it promises: The tricks of the trade, the birth of a media legend, the first of the faithful and the curious creature called... Sweet Young Thing! That sure sounds like a lot for a final issue, does it. But before we get to that we have more of the Return of the New Gods ahead of us! That kicks off in the next Newer Gods! Copyright © 2018 Nicholas Ahlhelm. Picture Window theme. Powered by Blogger.